Old Silversides started out as a normal ’86 Toyota two-wheel drive, extended cab pickup. After her previous owner had put two hundred sixty eight thousand miles on her, she was parked out behind his house. I spotted her rusting hulk in the fall of ’99, I believe. After conversing with the owner about the repairs she needed and negotiating the purchase price down to my standard price of one hundred dollars, it was time to retrieve my prize. 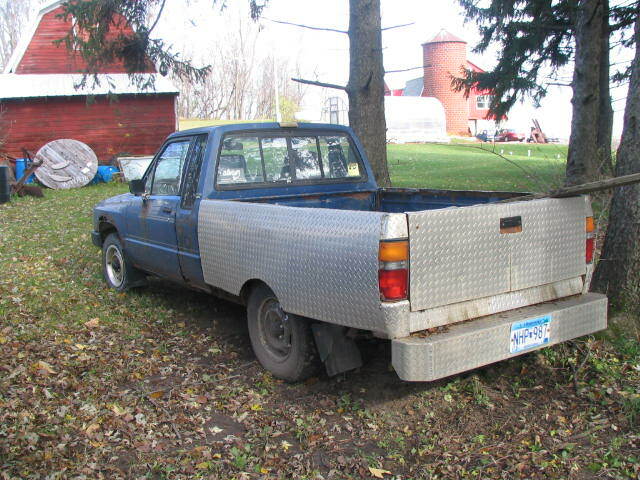 I drove my current truck, an ’82 Toyota, to where my “new” truck was and proceeded to try pulling it home. It was early December, as I recall, and the truck had sat long enough to sink into the dirt that was the guys back yard, which by now had frozen solid. My trusty ’82 could not budge the new truck from her final resting place. Bummer! I drove back home and got my faithful tractor, Ol’ Bessie, and retuned with a hefty log chain. Since the new truck was only a mile away in downtown Wanamingo, the trip by tractor wasn’t too bad. A good tug on the rear bumper freed my new found treasure from it’s ruts and I proceeded to tow it home, with help from my son, the driver. Once home and in the confines of my shop, I got to work replacing the head gasket that was bad. This being my first experience with a fuel injected Toyota, I was a bit apprehensive about tearing into it. But with a good shop manual in hand and some patience in removing the myriad of belts, hoses and brackets from the engine, I found the head removal process fairly straightforward. In the process of removing the head I discovered that it was cracked. This was fairly common on this model of Toyota engine, I found out later. With a bit of heli-arc welding and some luck, I had the head repaired and recut the valve seats while I was at it. After everything was cleaned up and reassembled, it was time to fire the beast up. After only a couple of cranks of the starter she fired right up and settled into a fast idle. Nice. And therein lies the beauty of the fuel injected system: these things can sit for extended periods of time with old gas in the tanks and still fire right up and run just fine. Amazing. Try that with your carbureted engine, if you dare! I drove it to work a couple of times but not having a radio to listen to was a real downer. Also, the box was severely rusted to the point where the sides had huge holes in them. A common problem, I found out from someone who was knowledgeable on these things. Apparently, Toyota had used recycled steel to make the boxes while the cabs were made out of new steel. That would explain why her cab was in mint condition (according to my standards) while her box was falling apart. Not wanting to turn my new truck into a flatbed just yet, I opted for another solution, one that would still retain the box, tailgate and tailights. I went over to Dodge Center and bought a bunch of thin aluminum deck plate and proceded to cover the rusted out box with sheets of the stuff. It only took a couple of days of cutting, fitting, riveting and some minimal welding and presto! Nice shiny truck box! Guaranteed never to rust out. The thing turned more than a few heads the first time I drove it but I didn’t care. It was a hundred buck truck, destined to be a work beater if nothing else. ← At the I-94 I-90 split. Still smiling.